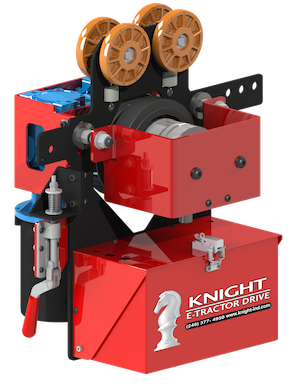 Knight KET3000 Electric Variable Frequency Drive (VFD) Tractors are equipped with our proven tractor mechanics using a worm gear reducer that is reliable and maintenance-free. They provide the operator with complete control. The KET3000 Series has a modular assembly design for easy installation and set-up. Different configurations are available depending on the type of Knight rail you are using. The VFD Electric Tractor can also be configured to run on different manufactures rail systems. Maximum Speed: 180 ft. per min. [2.0mph]. Maximum Towing Capacity: 3,000 lbs. [1,360kg]. Dual Rubber Drive Wheels: rides on bottom of rail. Hand Clamp to engage and lock tractor in position. Direct Drive with programmable speeds, acceleration and deceleration points. VFDTA1001 Single Speed Pendant with Run-Stop/ Reset Button. Standard Inverter Motor: 1/3 HP, 230VAC. Standard VFD controller: 230VAC, Single Phase, for variable speeds. Product Weight: 90 lbs. [41kg]. Optional EBA1128 Two Speed Pendant with Run-Stop Button. Optional 24VDC Drive clutch for free wheeling function: engaging and disengaging tractor drive to the rail. Optional Shock Absorbers for End of Travel. Optional (Return to Home) Feature. Optional ability to run (2) two tractors simultaneously for greater bridge spans. Optional ability to run in conjunction with a Knight Servo Hoist.